The Sustain Worldwide organised VIP visit to the Sir Terry Farrell master-planned, 13-acre, mixed-use Regent’s Place Estate in London on 29 November created positive interest amongst the guests. Thirty VIPs and press attended the event, which was hosted by Sarah Cary, Sustainable Developments Executive, British Land, who owns and manages the site. The guests enjoyed a behind the scenes tour of the estate, located in a previously run-down part of London, which is now boasts a vibrant community feel. The British Land exemplar has been more than a decade in development and the latest phase, which our guests saw for themselves, completes the picture. 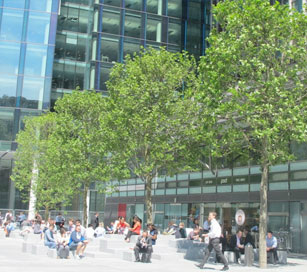 The North East Quadrant phase consists of two commercial office buildings sited at the gateway to Triton Street, a residential building comprising 154 apartments, a 20-storey tower with views over Regent’s Park and private landscaped gardens, the New Diorama Theatre, retail spaces, external landscaping and public works of art. Sarah was joined on the panel of speakers by Giles Martin, Director, Wilkinson Eyre who spoke about the architecture of 10 Brock Street and how it has contributed to the estate’s sense of place by creating a vibrant and sustainable place for the community; Phil Draper, Senior Sustainability Manager, Regent’s Place Management Team and Rob Richardson, Estate Manager, who spoke about the building in operation, day to day energy/ waste/ethical/community results; and Steven Shepherd, Managing Director UK, Climaveneta who talked about the role of HVAC in creating a positive and sustainable, energy efficient working environment.